Driving High on Marijuana: How Bad is it to Drive Stoned? After alcohol, marijuana is the most frequently detected drug in crashes. What are the real risks you take? An overview on the legal topic here. ARTICLE SUMMARY: Driving stoned can be more dangerous than you think. We look at impairment, detection, and some general laws around marijuana DWI in the U.S. here. Can I get a DUI with Medical Marijuana? Am I Too High to Drive? Since the legalization of marijuana across various states in the U.S., drugged driving has become an increasing public concern. No one should ever drive impaired. But people do. After alcohol, marijuana is the most frequently detected drug in crashes. But how dangerous is it to drive when stoned? Weed is known to impair driving. However, new studies released by the NHTSA reveal that drivers who use marijuana are at a significantly lower risk for a crash than drivers who use alcohol. To make the problem more complex, roadside detection of marijuana is difficult. And while driving high may be difficult for law enforcement to detect, it doesn’t mean it is less dangerous than alcohol. Any substance that impairs your cognitive functions should be used with caution and one should never operate a motor vehicle while under the influence. This article aims to look at each of these factors. We invite you to continue reading below. Finally, your questions are welcomed at the end. We ty to respond to all real-life questions with a personal and prompt reply. How Does Weed Impair Drivers? Further, mixing weed and other drugs can amplify the depressant effects of cannabis. And we hope that it goes without saying you should never drink and drive under the influence of alcohol and cannabis. The combination of both in a driver’s system can be fatal. This recent study published by Canadian researchers highlights the effects cannabis can have on your driving performance. According to the study, using pot before driving increases the risk of a crash even 5 hours after inhaling. If you use cannabis for medicinal purposes, this can be very problematic. It’s important to know how marijuana affects your body and always wait a few hours before operating any motor vehicle. If you need some more evidence, there’s plenty of studies that suggest cannabis use impairs drivers. This research suggests that blood THC concentrations 2-5 ng/mL are associated with substantial driving impairment. According to the CDC, one person dies from alcohol related crashes in the US every 53 minutes. Drugged driving is not measured this way so it’s difficult to compare both. However, studies show that the odds are much greater when you drive drunk than stoned. Indeed, the chemical complexity of psychoactive drugs poses a major problem with how data is collected among law enforcement. Complex molecules, body absorption, and elimination of drugs in your system make analyzing impairment levels considerably different from alcohol. Currently, specific drug concentration levels cannot be reliably categorized to a certain degree of driver impairment. More research needs to be done to understand how marijuana diminishes in the body hours after using. However, this research remains incredibly difficult to perform because the FDA still classifies weed as a Schedule I substance, as dangerous as heroin. Still, the U.S. Department of Transportation’s Office of Behavioral Research has carefully researched and examined these elements and are working on developing new methodologies for gathering data. New devices are being developed by law enforcement to combat high drivers. However, the accuracy of these devices are unknown due to the psychoactive components in THC that impair everyone in a different way. In the U.S., the term “illegal per se” refers to any act that is considered inherently illegal. “Per se” laws in DUI cases generally mean that the drivers BAC is over .08 percent. When it comes to marijuana. “a per se marijuana DUI law might set the limit at a certain number of nanograms of THC per liter of blood or any measurable amount of THC. Impairment DUI laws also vary by state. In some states, a driver is considered under the influence if at all affected by marijuana. Other states require proof of substantial impairment. Yes, you can get a DUI for driving while using medical marijuana. It’s common knowledge that driving under the influence of any substance is illegal. Marijuana is no exception. If you live in any state that has legalized marijuana for medical purposes, you might think that you can still operate a motor vehicle. This is not the case. Currently, there is no state in the U.S. that permits driving under the influence of marijuana. It’s important to keep in mind that this app should not be used to determine if you’re safe or not to drive but can be good if you want to be extra sure you’re safe behind the wheel. You should never drive under the influence of anything. Think through the risks. Look at the penalties. Think again. Plus, recreational weed is still illegal in most states. So, it’s important to always remember that if you choose to drive under the influence of marijuana you also risk strict penalties, fines, and even jail time. The bottom line? 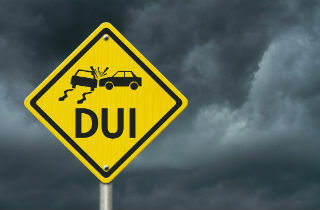 Avoid a DUI – DON’T DRIVE HIGH! Alana Redmond is a legal content writer who works with David Breston in Houston. Alana focuses her writing on drinking and driving laws, technology and consumer safety across Texas. She is a graduate from the University of California San Diego. You can learn more about Alana on her Linkedin or reach her by email at aredmond1point21@gmail.com.